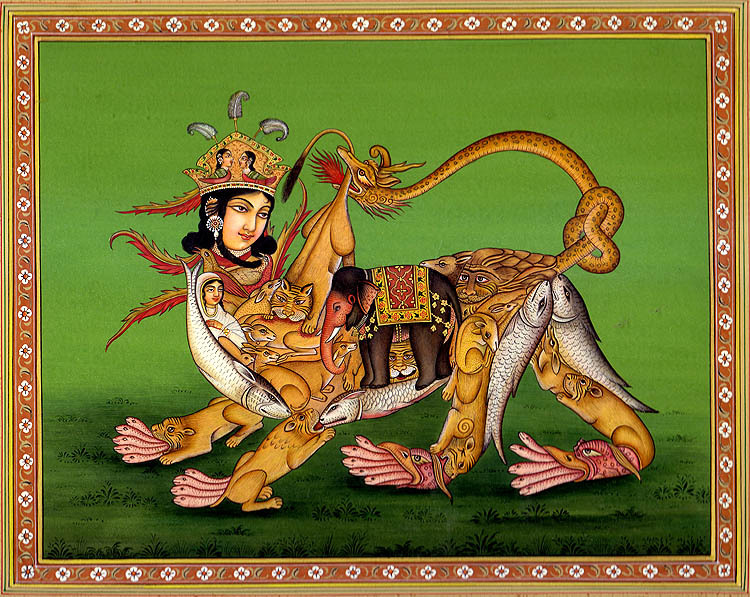 This interesting miniature, rendered against a pistachio green background, lower part denotative of the earth being darker, in the Provincial Mughal style as it prevailed at Mughal provinces like Oudh around the late eighteenth century, represents a grotesque form with a woman’s face implanted on the torso of a lion-like looking four-legged animal figure. It has a long knotted upwards thrown tail composed of a fire-emitting mythical pantheon holding in its mouth a lion by its tail. Wearing a triple-crested crown-like cap studded with precious stones and made of gold and a multi-stringed pearls-necklace around her neck the lady seems to have royal links. With large eyes, thoughtful or as intoxicated, well trimmed eye-brows, finely modeled nose, cute pinkish lips, deep dark thick hair and glowing cheeks the lady-head, which constitutes the head of the animal form, another woman icon clad in white comprising the animal’s neck-part and a few animal forms alone are normally conceived, other forms being grotesque or at least mythicised. The cult of such multi-forms blending to create a bizarre or grotesque form, sometimes awe-inspiring, has been prevailing not only in Indian but also in Chinese, Egyptian, Christian and Central Asian mythological traditions since early times. In late medieval era the woman has been the theme of many artistic experiments, and a number of grotesque forms came into being using the forms of youthful women to comprise them, more popular and initial among them being an elephant form. A blend of the forms of nari – woman, and kunjara – elephant, such form was known as Nari-kunjara – elephant composed out of a woman’s figure or women’s figures. Subsequently there emerged other animal forms : camel, horse, peacock among others composed of the multiple women figures, though as the elephant was alternated some times by other animal forms, the forms of the women, components of the main figure, were also substituted or supplemented by various animal and human forms – male or female. The form represented in this miniature is a lioness, its gender being determined by the face of the woman comprising its face and head. But for the disposition of the face, with its bent legs, downwards tilted back and upraised tail the lioness seems to charge at its hunt. While the composition involves numerous forms : lions, fish, rabbits, snakes – including a pantheon, elephant, birds, deer, half-women-half-birds, women-forms, and even mythical beings – human and animal, the number of snakes alone being twenty, it also involves as great and rare skill required for assimilating so many forms in one composition without making it monotonous. The cult of blending forms has been further extended into two tiny icons used for adorning the cap, the heads and necks of the figures being those of the women while the rest of the bodies being birds’. The forelegs of the lioness are composed of two lion-figures with their heads turned diagonally opposite to each other. There release from the mouth of one five snakes, and from the hind part of the other, four, comprising the fingers of its forelegs. The back legs are more elaborately conceived. Besides the two lion-figures and ten snakes for fingers, two half dragons are used for comprising the animal’s feet, two forms of deer for giving to the legs required length, and two large fish for adding sufficient volume and shape to the thigh parts. A beautifully saddled elephant comprises the figure’s back while a large white fish and a woman’s form, besides some rabbits and deer, the neck’s bow-like rounded lower part. The haunches wherefrom rises its massive tail are composed of an awful mythical human figure with tough long hair turning backwards and shaping the hind part.